“Le coup d’envoi du festival sera véritablement donné le dernier week-end d’avril, avec trois concerts exceptionnels, et à chaque fois une tête d’affiche : Marcel Azzola à Breteuil, Michael Lonsdale à Verneuil, et Gérard Gasparian à Tillières”. « Triomphe pour les grands romantiques » … Sa vision de Chopin est à mi-chemin entre celle de Samson François et de Claude Kahn. 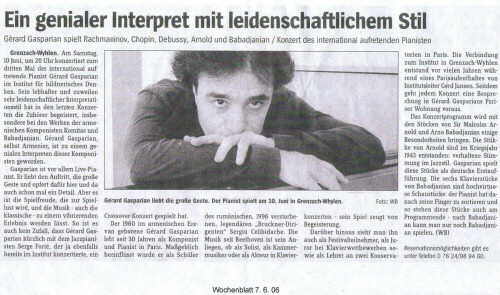 Gérard Gasparian tackled the Sonata op. 101 of Beethoven, so full of emotion, with expressive energy, eager determination and rigorous self-control. With verve and an amazing “jazzy” sound he hammered the second movement like a march. Very emotive, as in a passionate state of ecstasy, emotionally charged and a powerful discharge of emotions, the pianist has mastered the audacious Fantasia op. 17 of Schumann resembling a “cri d'amour” only for his beloved Clara Wieck. Gasparian abandoned himself to a stormy outburst of feelings, to the depths and labyrinth of this Fantasia while unfolding perfectly its poetry. As if unchained, Gasparian interpreted as well his own Sonata with expressiveness, which, with its hammered passages and ecstatic sound, drew attention. 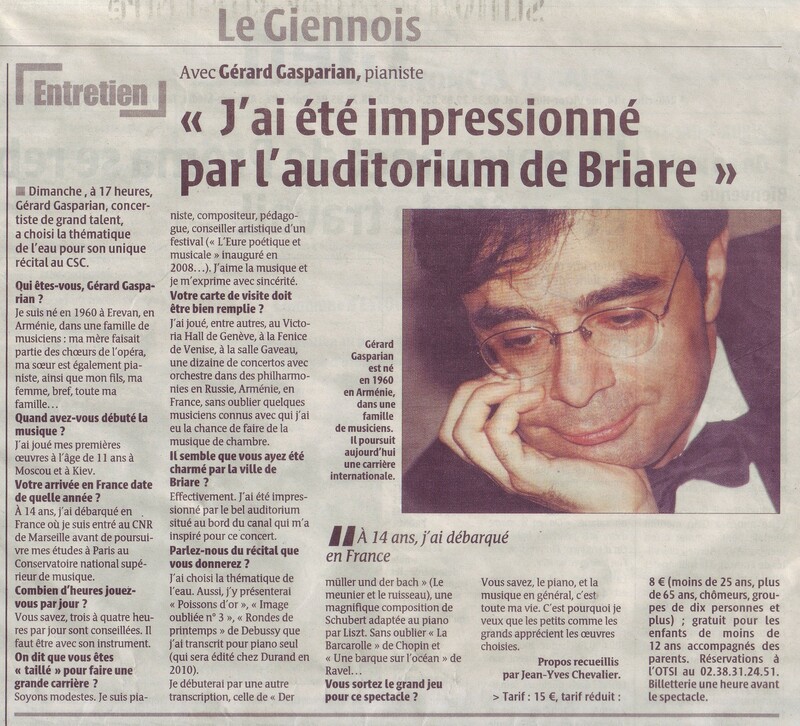 In the first part of his concert, Salle Cortot, and for the great pleasure of his audience, Gérard Gasparian put forward his irreproachable technique in the service of the 12 Preludes (second book) of Debussy, emphasizing the colour and outline, at all times very clear. His playing with restrained emotions but always at the level of the notes, underlined the fluidity of the sound of the composer while restoring an harmonic audacity. In the second part Gérard Gasparian proposed the last Sonata of Beethoven, the Sonata n° 32 op. 111. A real pleasure, a perceptible emotion. Gasparian brought out the richness of colours of this work whose Final Arietta is one of the most magnificent creations of the genius of Beethoven. 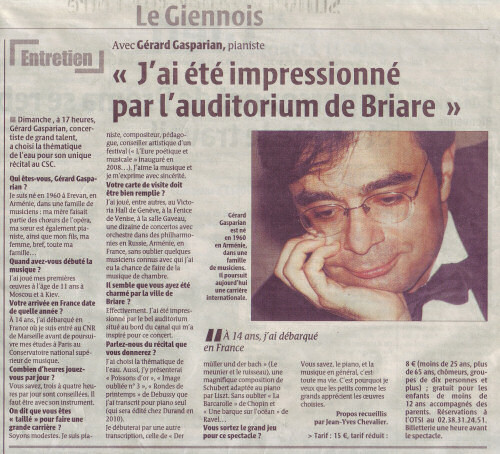 At the end of the concert Gérard Gasparian called the audience's attention to discover a composer – Komitas – of course less famous than Debussy and Beethoven but he served him as well with his Four Dances and Six Songs bringing out the most naturally the deep relations between people and their roots. 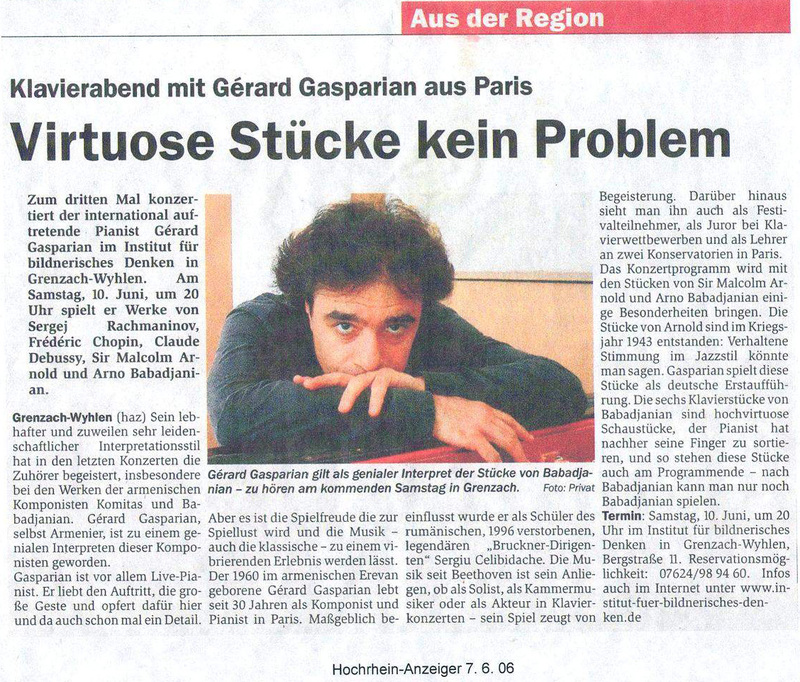 "Gérard Gasparian began his programme with three Scarlatti sonatas, presenting each one as if it were a pearl. His style was limpid; his sonority came from a touch that was both dense and transparent." He approached Schubert's Opus 90 Impromptus with power and an expressive lyricism, some of them with an almost frantic melodic expressivity and speed, carrying the audience into the heart of romanticism. Gasparian brought a rare enthusiasm and passion to the work, along with an occasional touch of impressionism. As for the four Chopin Impromptus, they won us over with their brilliance and elegance, their gentle and melodic charm. For lovers of piano music, the high point of the concert was the Debussy Préludes of Book One. 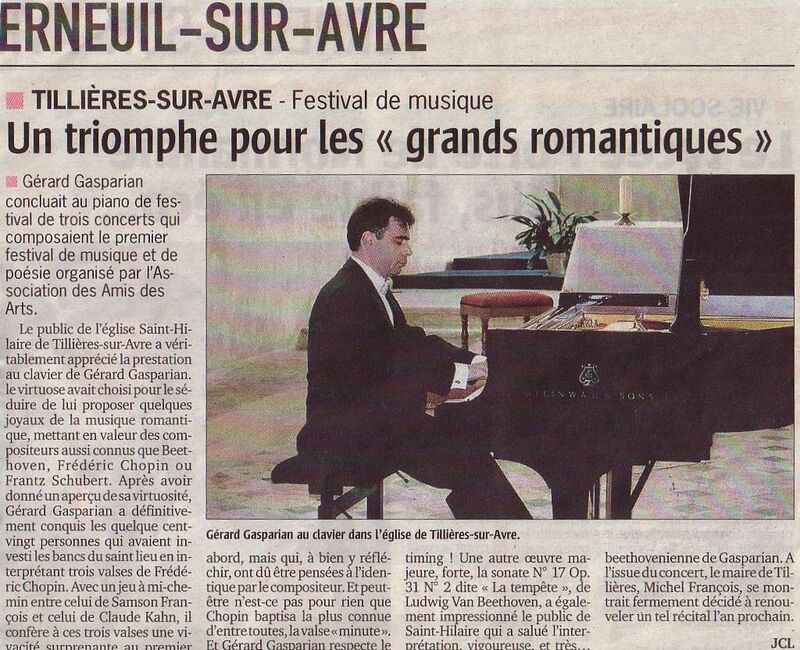 Gérard Gasparian, with his savoir-faire, brought out the refined magic of the sound. Sensitivity and poetry permeated the entire work whether in Danseuses,Voiles or the Baudelairian atmosphere of Les Sons et les Parfums..."
"Gérard Gasparian conceived the music as a homage to Romanticism, as well he might. The beautiful Nineteenth-century music of Schubert and Chopin (he played the Impromptus of both) here found the right setting, as did the 12 Debussy Préludes (from the first Book) which, however, are more impressionistic than romantic. 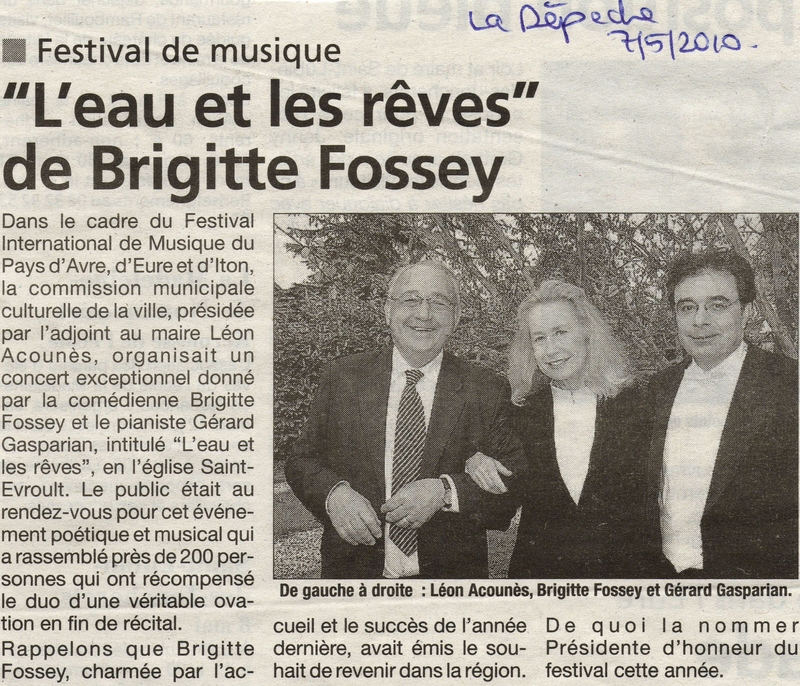 A number of the pianist's pupils were present at the brilliant recital yesterday at La Frette, and they added their cheers to the public's ovation." 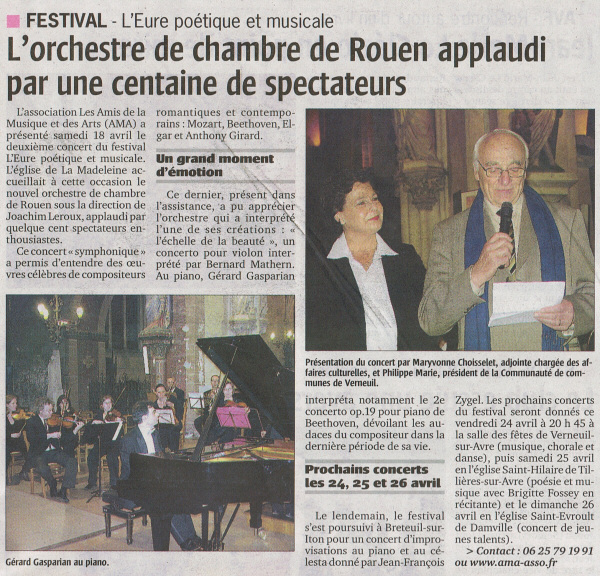 "Recital ... of Gérard Gasparian (piano) and Roland Daugareil (violin), who played Brahms, Beethoven and Ravel sonatas. A magnificent concert, in which the quality of the two musicians' performance - both are at the height of their technical and musical powers - fired the enthusiasm of the public." "His playing is not unobstrusive accompaniment but active participation. Constantly present but never excessive, he manages to preserve the unity of the duo without ever upsetting its balance.These qualities worked wonders in the romantic Brahms F minor Sonata which is alternately passionate, dreamy, gay and brilliant. In the Schumann Papillons, Gasparian, relying on his strong technique, was able to bring out the sometimes sharp contrasts in this work with its constantly changing moods, and inexhaustible melodic wealth." "The Bach Preludes and Fugues were played with feeling, the authoritative left hand and sensitive right hand reminiscent of the organ. The six Debussy Préludes were very well performed; the pianist displayed his technique to advantage. 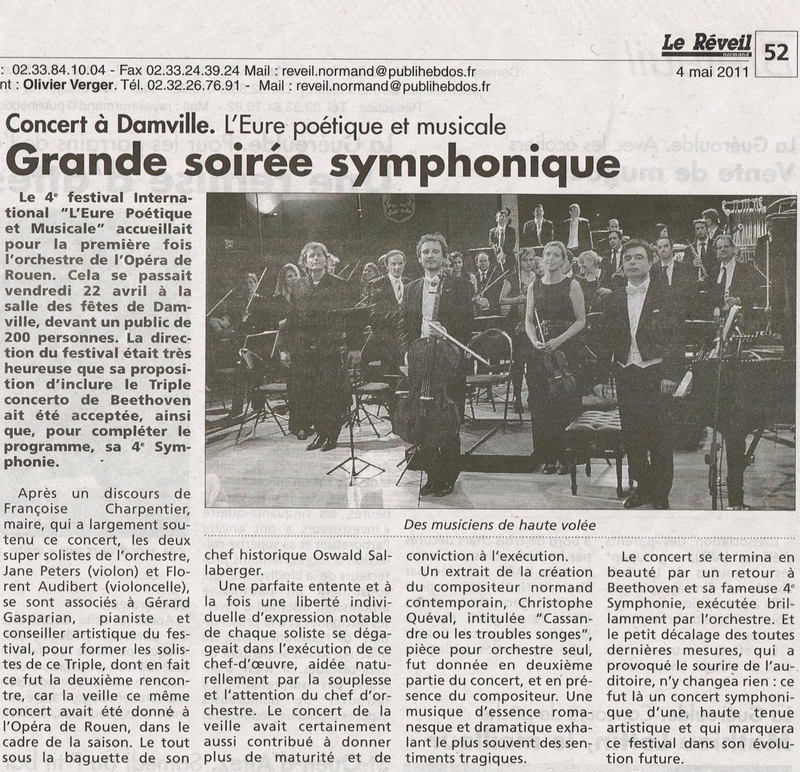 The five Prokofiev Sarcasmsopus 17 were played with vigour and strength - a remarkable performance." 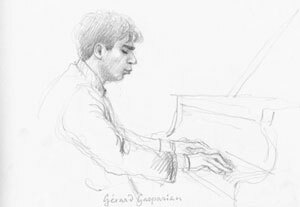 "At the Salle Cortot, Gérard Gasparian performed three of his own piano compositions. The public's response was spontaneous and enthusiastic. We hope to hear more of him. Both performer and composer pleased us enormously." "By inviting Gérard Gasparian, pianist, and Jean Ter-Mergurian, violinist, the Office of Culture gave us an out-of-the ordinary evening, owing to the quality of the artists who brilliantly interpreted the works of Mozart, Bach, Debussy, and Sarasate, as well as a sonata for violin and piano written by G. Gasparian himself. They charmed a public of connoisseurs and gave us an evening of great quality."